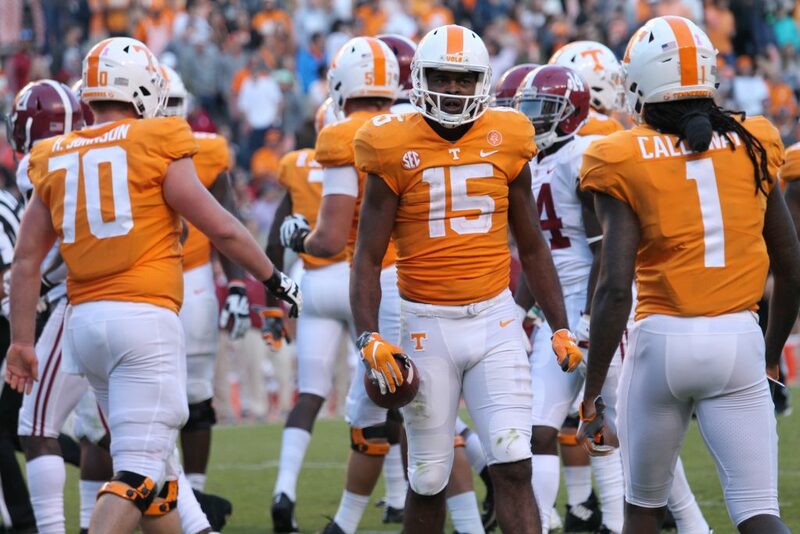 Jauan Jennings had a decision to make. And on Monday night, he finally made up his mind. The redshirt junior receiver was debating on whether or not to return for his fifth and final season as a Vol or to declare for the 2019 NFL Draft. He had until midnight on Monday to make his decision, because that was the deadline for underclassmen to announce per the NFL’s guidelines. After talking with UT’s coaches and deliberating, Jennings has decided to come back to Tennessee. Jennings posted on his Instagram account on Monday night that he is returning for his redshirt senior season in 2019 and will spend one last season as a Vol. Jennings flashed a ton of potential as a sophomore in 2016, reeling in a Hail Mary touchdown to beat Georgia and making a big touchdown grab against Florida the week before. He finished second on the team in receptions and receiving yards that season, totaling 40 catches for 580 yards and seven touchdowns. Hopes were high for Jennings in 2017, but then he injured his wrist just before halftime of the Vols’ season-opening game against Georgia Tech, and it cost him his entire season. He wanted to come back when the Vols were taking on Vanderbilt in their season finale, but that didn’t happen. Jennings ended up posting a video to his Instagram account that included a profanity-laced tirade bashing UT’s coaches at the time. Interim head coach Brady Hoke and then-AD John Currie made a joint decision to dismiss Jennings from the team just days before Tennessee took on Vanderbilt. Once Phillip Fulmer took over as AD and hired Jeremy Pruitt, Jennings began pleading his case to both men to be let back on the team. After fulfilling a long list of requirements Pruitt laid out to him, Jennings was welcomed back. But due to offseason surgery, he didn’t participate in spring practices and ended up being limited during fall camp too. Jennings showed some of his old play-making ability at times in 2018, but his nagging injuries kept him from performing to his full potential. He caught six passes for 102 yards against Alabama and also hauled in five receptions for 71 yards and a touchdown in Tennessee’s win against Auburn on the road. But he also had three games in which he totaled just one catch, and he had three others where he made just two receptions. He sat out Tennessee’s game against Charlotte to rest up before the final stretch of SEC play. The Vols will have an experienced receiving corps in 2019 thanks to Jennings’ return. He’ll be the most veteran player in the group, but he’ll also likely be joined by seniors Marquez Callaway, Brandon Johnson, and Tyler Byrd as well. The 6-foot-3, 221-pound receiver finished this past season with 30 catches for 438 yards and three touchdowns. In his 35 career games, Jennings has made 87 catches for 1,184 yards and 10 touchdowns.